Over the past year, our company has grown drastically. While in the process of recruiting prospective team members from both within and outside of the Philadelphia region, our HR department often found themselves bombarded by candidates with questions about relocating to Philadelphia. Rather than answer each question from each and every newcomer, Emily and Dana (our People People), racked their brains and reached out to the team with the concept of creating a neighborhood guide to include in their hiring packages. It was brilliant! We thought, why not source information from our team of Philly insiders (literally) to help make the move to Philadelphia that much easier. We assembled a task force. Together we surveyed our Team to find out where they live, what they like and dislike about their ‘hood, and to name a few interesting places to check out. We then took our findings and pulled in our Content Team to make sense of it all. Shortly after, the Design Team used a tool called Strikingly to put the site together so we could start sharing the guide with our new employees as soon as possible. But how could we be so selfish and keep this tool to ourselves? That wouldn’t be very Seer-like, would it. The Philly Neighborhood Guide is a tool that embodies a number of our Seer Values—Share what you learn, Build Community and Practice Kaizen. At Seer, we always want to grow and learn, and this tool is helping us do just that. We weren’t finished just yet though—Seer is known as a digital marketing agency, and we couldn’t share the guide and allow it to sit stagnant. Great content is meant to be found, right? So we added more people to the Team (Graham and Jordan), who’ve helped us optimize the site and share it with a broader audience. The response? Well, just look at the shout-outs below. We are so grateful for those who find the tool useful and have shared the guide amongst their friends. 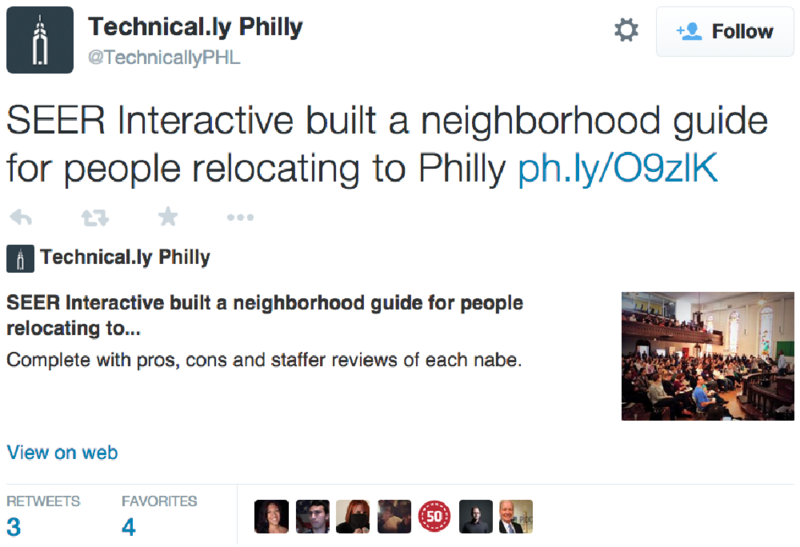 And we can’t forget to mention that we were featured both on Technical.ly and Philly Mag. Thanks for love! However, not everyone is going to love the Guide, and that’s okay. We know that we can’t please everyone with our recommendations, and as we mentioned before, we at Seer like to practice Kaizen. Just know that we hear you, and that we’re fully aware that not every Philadelphia neighborhood or awesome spot to check out is listed in our guide. We wanted to focus on what it’s like to live in each neighborhood, from the perspective of our team members living there. So any neighborhood that doesn’t have a Seer team member in-residence had to be left off our list. We also know that creating the guide is subjective in nature. We did our best to provide an insider’s perspective on what we as Philadelphians know and love. Don’t like Pat’s and Geno’s? Think touristy and tasty are inversely related? That’s okay. We’re Philadelphians, who would we be without our strong opinions? As we move forward to the next phase, we have high expectations for ourselves and for the guide. We hope to recruit more talent, and thus expand our list of neighborhoods. We also hope that as people relocate to Philly, or as people search for new places around our city to discover, that they find our recommendations valuable and want to share what we have created. True to Seer’s values, we created the guide as a resource to help those in our community—and those soon-to-be members of our community. We will continue to share what we love about Philadelphia with our community, and hope to re-visit the guide as our team and as our city grows and continues to evolve. If you’re interested in viewing the guide, visit the site here and let us know what we can do to improve! And hey, if you’d like to see your ‘hood represented, we’re always hiring.